We have opened our iconic 1972 Airstream trailer for the season at The Greig Farm! Follow us on Facebook to get updates on events and our new food stall at the River Street Market in downtown Troy, NY. Please check out our online menu which we can use to cater your private or company event from our spiffy food truck. 1. Like a sandwich, but much tastier. If you’re looking to buy some of our fabulous smoked Pistachios and Almonds, you can head to our online store. Fun fact: Papa’s Dill Pickle Smoked Pistachios won the “Best Non-Pickle Pickle Product” at the 2018 Rosendale International Pickle Festival. 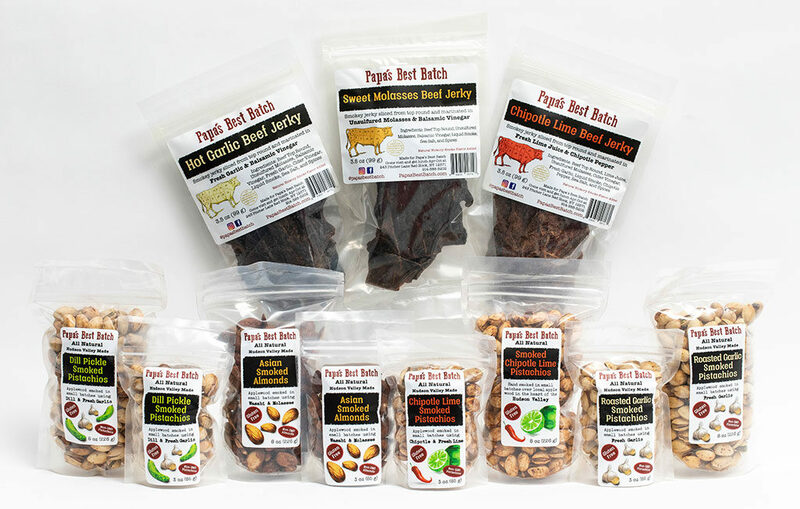 Papa’s gourmet Pistachios and Almonds and (new) Beef Jerky are sold in over 175 stores throughout the Hudson Valley and western New England. Stop by any of these shops and markets to bring Papa’s robust, unique flavors home. If you love us, please reach out to us on Facebook or Instagram #papasbestbatch.